Errors reported on the Error Code Analysis dashboard might be different from errors reported on the API Proxy Performance dashboard because that dashboard calculates error rates based on the is_error flow variable. That variable can be explicitly set by the API proxy, so it is not related to the error codes in the proxy response or target response. A proxy can handle a target error and still return a success response. In this case, the error is counted as a target error but not as a proxy error. When the target response is either success or does not exist, but the proxy responded with an error, the error is counted against the proxy. If both the proxy and target respond with an error, the error is counted on the target. Video: Watch a short video for an overview of the Error Code Analysis dashboard. 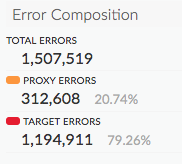 Total Errors The total number of proxy errors + target errors that resulted from all requests and responses seen in an Apigee Edge organization over the specified time period. Proxy Errors The total number of proxy errors seen in an Apigee Edge organization in the specified time period as determined by the response code. Proxy errors are measured between the time an entire request is received by Apigee Edge from a client and the time the request is sent to the backend target. Target Errors The total number of target errors seen in an Apigee Edge organization in the specified time period as determined by the target response code. Target errors are measured between the time an entire request is sent by Apigee Edge to a backend target and the time the response is returned the client app. Total Proxy Errors The total number of proxy errors seen in an Apigee Edge organization in the specified time period. Proxy errors are measured between the time an entire request is received by Apigee Edge from a client and the time the request is sent to the backend target. 4XX Shows the number proxy errors that resulted in HTTP 4xx errors. For a complete list of HTTP status codes, see "Status Code Definitions" in the HTTP specification. 5XX Shows the number API requests that resulted in HTTP 5xx errors. For a complete list of HTTP status codes, see "Status Code Definitions" in the HTTP specification. Total Target Errors The total number of target errors seen in an Apigee Edge organization in the specified time period. Target errors are measured between the time an entire request is sent by Apigee Edge to a backend target and the time the response is returned the client app. 4XX The number target errors that resulted in HTTP 4xx errors. For a complete list of HTTP status codes, see "Status Code Definitions" in the HTTP specification. 5XX The number target errors that resulted in HTTP 5xx errors. For a complete list of HTTP status codes, see "Status Code Definitions" in the HTTP specification. The total number of proxy errors seen in an Apigee Edge organization in the specified time period for each individual proxy. Hover over the bars to see the number of errors that came from the each proxy request flow and from the target request flow, respectively. Proxy errors are measured between the time an entire request is received by Apigee Edge from a client and the time the request is sent to the backend target. The total number of target errors seen in an Apigee Edge organization in the specified time for each individual target. The number of calls that did not reach any target are listed in the Target Not Contacted column. Hover over the bars to see the number of errors that came from the each proxy response flow and from the target response flow, respectively. Target errors are measured between the time an entire request is sent by Apigee Edge to a backend target and the time the response is returned to the client app. The chart shows the number of errors that came from the proxy response flow and from the target response flow, respectively. The total number of proxy errors seen in an Apigee Edge organization in the specified time that returned each response code. Hover over the bars to see the number of errors that returned each response code. The total number of target errors seen in an Apigee Edge organization in the specified time that returned each response code. Hover over the bars to see the number of errors that returned each response code. 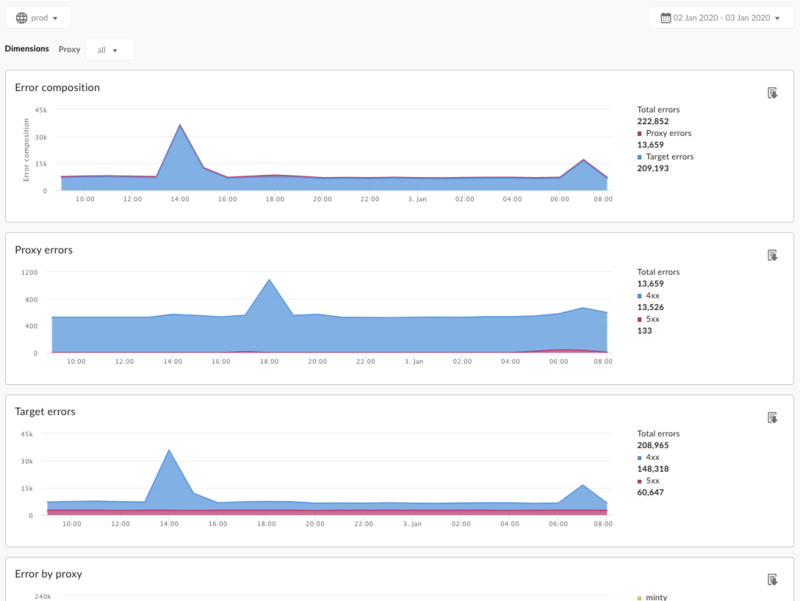 You can view metrics for all proxies or drill into specific proxies using the Proxy dropdown menu at the top of the dashboard.